Three types of food was dehydrated for about 12 hours. The process was to make a slurry, pour onto Teflon pans lightly greased with olive oil. The material was dried for about 12 hours at 135F. When completed the material was beat into a powder in a stand up blender. The end product was placed in bowls for current use and some was vacuum packed for longer storage. The material dried was a mixture of eggplant and tomato, some previously cooked soy beans, and some gruel. To appreciate the reduction about a liter of the soy beans and gruel was processed and yielded a bowl of dried material. One might ask why. The answer is a method of storage for off season use maintaining most of the materials nutrients. Small volume, and possible to store at almost any temperature. 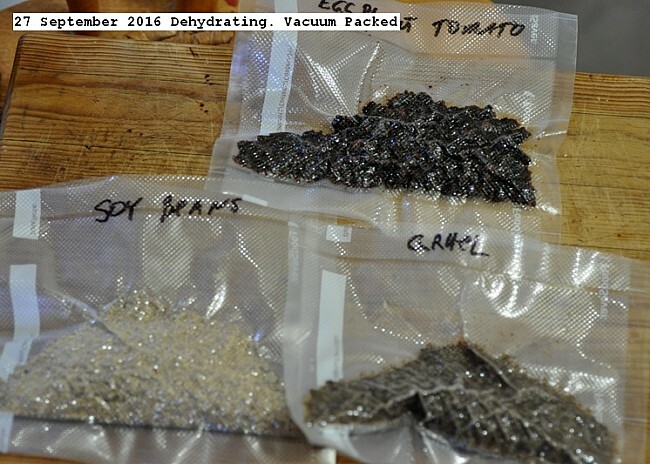 This entry was posted in Uncategorized and tagged 27 September 2016 Dehydrating, Dehydrating, Dehydrating eggplant, Dehydrating Gruel, Dehydrating soy beans. Bookmark the permalink.